Would you describe yourself as a bright, energetic, trustworthy individual, with a warm, welcoming personality who loves working out? If so, contact us about working at our Front Desk. Some fitness/wellness or retail sales experience is required, as well as familiarity working with computers and great attention to detail. Qualified candidates should contact info@wfnyc.com with a resume and cover letter describing why you’d be the perfect person to represent Workout Factory at our Front Desk. Workout Factory is always looking for high-quality, experienced, dynamic, certified spin instructors, excited to learn our system. Qualified candidates should contact info@wfnyc.com with a resume and cover letter describing your approach and why you love teaching spinning. Liability insurance is required, as well as current certification. We especially welcome trainers who live in close proximity to our studio locations. 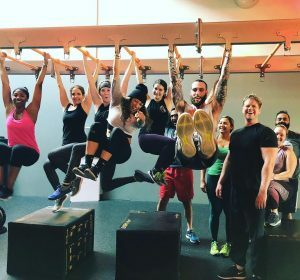 We are always looking for high-energized, experienced, dynamic, certified group fitness trainers, excited to learn our system. Qualified candidates should contact info@wfnyc.com with a resume and cover letter describing why are you perfect fit for Workout Factory. Liability insurance is required, as well as current certification. We especially welcome trainers who live in close proximity to our studio locations.